Another outcross red female that has quickly risen to the top. She is a very moderate made, deep bodied female with lots of milk. Her 1st son was a top Beef Maker calving ease bull. 2nd calf, a beautiful cherry red Trump daughter that has her sights set on a future donor. 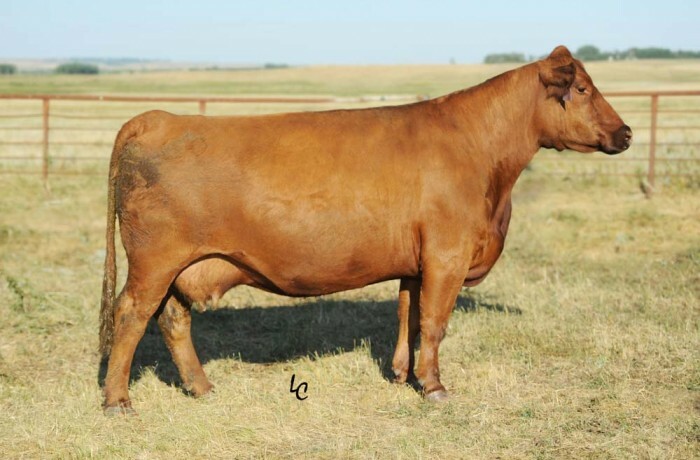 3rd calf, a Beef King son (CDI Rimrock 325Z) that is leased to Genex and a flush of Red Iron daughters just coming into production. She possesses that extra stylish front end and a cow family stacked with sound feet, perfect udders, and top production records.